Lenovo Standard Console - KVM console - 18.5"
The 1U 18.5-inch Standard is a cost-effective flat-panel console kit that offer a powerful and convenient way to manage space-constrained rack environments from a single console. This densely packed 1U solution let you easily set up and control rack-mounted servers. It offers additional space savings by allowing the mounting of the KVM switch in the space behind the console. 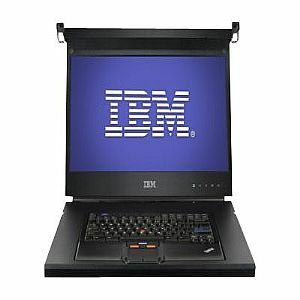 The kit include an 18.5-inch LCD display and accept an UltraNav keyboard. The 1U 18.5-inch Standard Console, when used with the Global Console Manager (GCM) or Local Console Manager (LCM) console switches provides a convenient way to locally access all systems installed in a rack. Consuming only 1U of rack space, it uses the least amount of space possible and ensures that your rack aisles remain free of equipment and cables.